Identity in the Age of Social Media: Blowing the Whistle on Authenticity — Anna Akbari, Ph.D. Ever wish there were more than one of you? Multiple selves to simultaneously give your work presentation, play with your kids (or dog), and write the next great American novel, all at once? Yeah, that’s not happening. We’re stuck with only one body and one mind. A singular fleshy mass of blood and bones with some very real time and space limitations. But we do live in a digital world where there’s no limit to the multiplicity of spaces our virtual bodies can inhabit. Though that’s not necessarily a good thing. Today I want us to contemplate what it means to be “real” in a virtual world. What constitutes “authenticity” in an age where curated digital representation — not the perfectly imperfect ball of energy that is us — is the dominant way in which we meet, interact, and create? Also: Can we ever be permitted to finally stop talking about authenticity? Hopefully, yes. Read on for how. [We now] live two lives. There’s the real us, the person in a kitchen or a bar, who speaks like a human with trusted friends, and then there’s what I call our avatar. Our avatar looks and sounds like us, but it’s not really us. It’s the persona we adopt in any sort of public sphere, which now includes your followers on Twitter and Instagram, and thousands of friends on Facebook. And bad things go viral, so everyone fears any misstep that could cause America’s pearl-clutchers to point and scream at you like the invasion of the body snatchers. Think of all the people who have lost job offers due to [an unflattering] picture of them. Americans today crave any kind of authenticity because our avatars are just so full of [crap]….Everyone’s social media persona is now like a candidate running for office — holding babies, doing photo ops...Facebook should be called TwoFacedbook. In movies, avatars are more interesting versions of ourselves, flying around doing whatever they want. But your avatar on Facebook isn’t better or stronger or faster than you are, it’s just prissier. Its great superpower is it remembers birthdays. Let’s start with this relentless concept of authenticity. Authenticity is a complex word and one with which we’re generally obsessed. But let’s get one thing straight: authenticity is a dynamic process — not permanent or static. And we’re asked to constantly reconcile fluctuating social and professional pressures with what we feel is our “true self” (as if that’s an obvious or absolute thing). Further dismantling any authenticity pipedreams is the fact that all self-expression is an affectation, be it in person or digital. Even our private selves are socially constructed. We are social creatures, and as such, we always see ourselves through the lens of how the world has taught us to understand what’s displayed. For instance, you might think you’re just putting on your favorite denim jacket — but I assure you that fondness is informed by a cumulative storm of social conditioning, subliminal and overt advertising, and other cultural influencers. There’s no unfiltered version of the self, even for you, blue jean baby. Authenticity is also not dictated exclusively by your biographical realities. That’s right: you get to design who you are. It’s a creative act. It doesn’t just happen to you. Your identity is multifaceted, can express itself differently in different contexts, and evolves over time. Hallelujah. Bottom line: Projecting authenticity (if we really must use that word) requires both experimentation and perpetual reinvention. Now, to the issue of our unsavory “avatars”: I agree with Maher that most of them are rather cringe-inducing. (Go ahead and take a minute to scroll through one of your social media feeds; see what I mean? 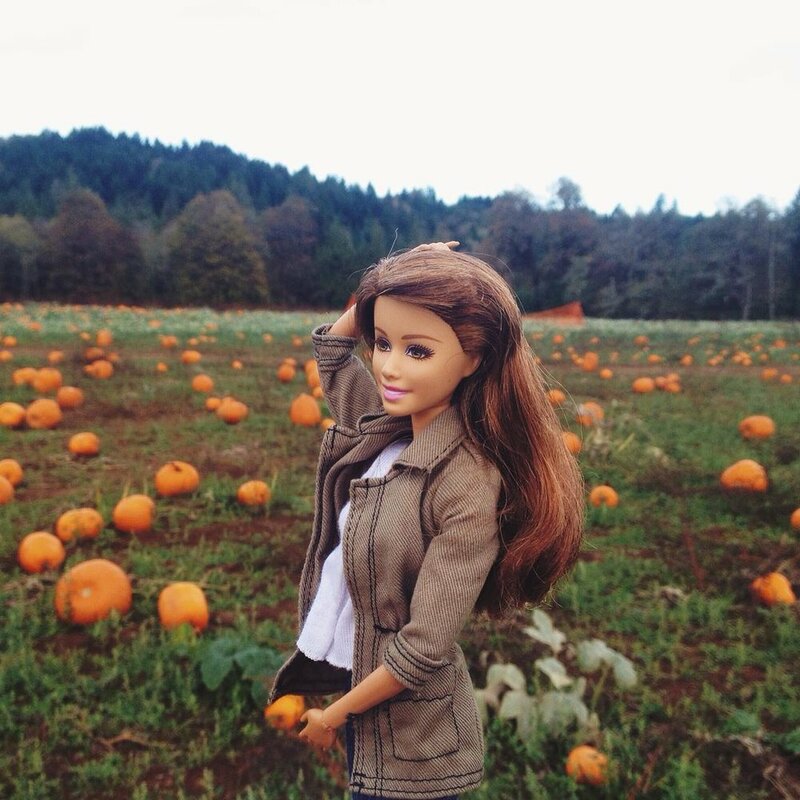 I bet you see a lot of Socality Barbie doppelgängers.) And creating bland, perma-happy, prissy online personas does no one any favors. Others feel crappy and inferior when they view it, and you likely feel like an imposter in your own life. Lose/lose. And then there’s the neverending avatar maintenance. In addition to real world trips to the salon and gym, our online identities require equally incessant curation and upkeep — new FOMO-inducing photos, interesting article shares, clever commentaries, and “showing up” to support your audience with perpetual “likes.” Our avatars are seriously exhausting. Even those of you with the best of intentions, eager to keep your avatars as “authentic” as possible, can’t always (or ever) present the full spectrum of who you are in any given context — we’re just too complex and dynamic for that. So we instead opt for presenting the most effective version of ourselves — which may differ from platform to platform and moment to moment. But does that make you less authentic? Let me answer that in the clearest way possible: WHO CARES? Let’s throw out the word authenticity altogether. It assumes you can divorce your behavior — online or in person — from social constructs, strategic agendas, and even mood swings. Which is impossible. Your identity is always in flux, never a science, and always an art. You have to wonder if the more bland we make our public avatars, the more weird we want to be at home. Anyone who works that hard to appear moral in public is usually a freak in private. It’s a theory I don’t have much evidence to support, except every evangelical pastor ever. If you want to know who someone really is, ignore their avatar and check out their web browser history. And yet, who amongst us is exempt from these contradictions and inconsistencies? And more importantly, who would want to be? Trying on different personas and highlighting peculiar and off-beat aspects of your life and personality gives you a deeper understanding of who you are. It allows you to feel more fully seen and appreciated — not to mention opening the door to connecting with a wider audience. In other words, it’s ok to be buttoned up on Linkedin while letting your freak flag fly a bit on your private Instagram account. But across every platform, don’t forget about a sense of humor: showing you have and appreciate one is always welcome. The world needs more lightness and levity. So stop worrying if other people are “authentic” enough and instead do a little social media navel gazing. Ask yourself: Am I expressing the full range of my persona, across my virtual platforms, in a way my target audience(s) can understand and that feels good to me? Or maybe just: Am I grossed out or bored to tears by what I’m projecting? Can I take myself a little less seriously? If you feel like your “real” persona extends beyond the limited biographical reality into which you were born, great! That doesn’t make you “inauthentic.” It merely acknowledges that you are first and foremost a human in action: fluid and capable of growth, bursting with imagination. We are multidimensional creatures in a constant state of flux. Embrace it and give others that same breadth to explore and communicate (assuming it’s done from a place of basic humanist principles and respect). I promise all this virtual expression is more than rampant narcissism (though it’s often also that): Studies show that the self you create and express in virtual spaces influences your belief (or lack thereof) in your real-world self. Avatars are not without consequence, so take them (but not yourself) seriously. Identity is an all-the-time, rest-of-your-life process of becoming, and technology is here to stay. Negotiating that intersection can be confusing, and there will probably be missteps, but you need not settle for being a bland avatar. Give yourself permission to be a bold, whole person that you can be proud of — in flesh and pixels alike. Are you a generic avatar or a whole person online? How do you balance the pressures of appealing to the masses with feeling like the “real” you? Tell me in the comments!